What do the fields under "Line Item" mean? 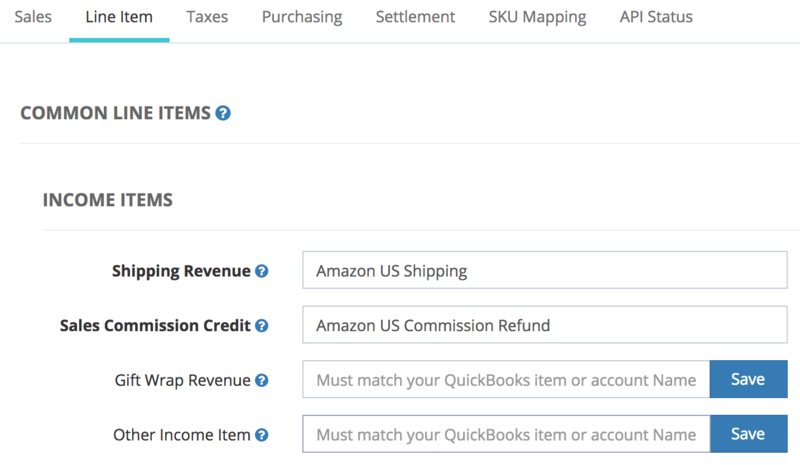 The settings on this page allow you to map the invoice line items to your QuickBooks Online services under Products & Services. You'll have to create corresponding accounts and services in QuickBooks Online's Products & Services for the items in this section. These services are mapped to specific Amazon transactions like Gift Wrap and Shipping. Once you've created the services and the accounts in QuickBooks Online, you can enter them into the fields below. Click on "Save" after each field to save your selection. You can also have us create the default accounts and then go to QuickBooks Online and rename them to whatever you want. If you rename them in QuickBooks Online, you'll have to refresh SellerZen so that we can grab the new account names. The services here should be linked to Income accounts. If you're creating them, they should be Type: Income and Detail: Other Primary Income. When you create the service item, make sure you select the proper account for the Income account field (you can select an Income or Expense account here). Sales Commission Credit is a refund of the referral fee on item price you paid when customers are refunded. You aren't refunded the complete amount you paid, as Amazon keeps a small portion for a Refund Administration Fee. Other Income Item is the default account we'll use for all other income received on the sale that hasn't been mapped. You can map individual transactions in the "Other Line Items Mapping" field below. Shipping Discount is the discount customers receive on shipping. This can be because of free shipping or Prime orders. This account needs to be Type: Income and Detail Type: Other Primary Income. Goodwill Discount is the discount customers are issued by you or customer service representatives. This account should be a Type: Expenses. The Detail Type can be Advertising/Promotional or whatever best describes this type of discount. Promotions is the discount customers receive for any promotional campaigns. If the promotion is sponsored by Amazon, you'll receive a credit for the discount customers receive. If you're creating the accounts manually, the accounts for this section should be Type: Expenses Detail Type: Other Miscellaneous Service Costs. Other Fees & Expenses are other fees on the sale that aren't mapped. You can map individual transactions in the "Other Line Items Mapping" field below. Sales Commission is the referral fee you pay on each item sold through Amazon. Fees depend on categories and range anywhere from 8% to 45%. Return Fee is the fee you pay Amazon for processing the refund. This fee is generally 20% of the fees Amazon collected on the order. It's also called the Refund Administration Fee. FBA Pick & Pack are the fees you pay for using FBA. This includes picking and packing your products. 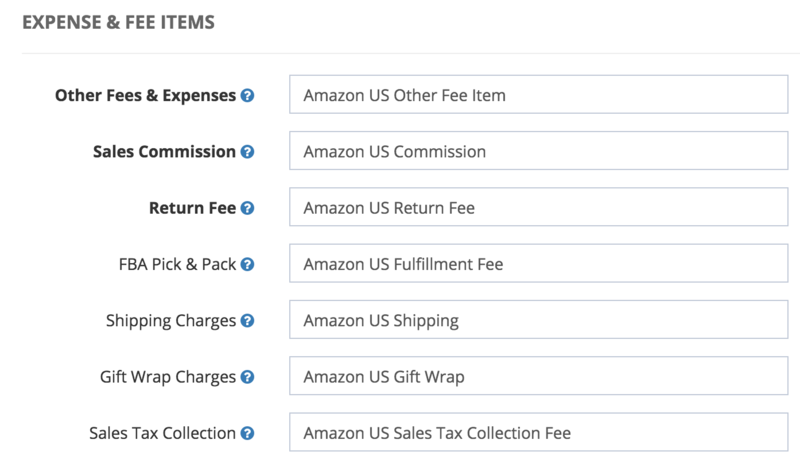 Shipping Charges is the shipping income that Amazon takes back from you if you are using FBA to fulfill orders. These chargebacks happen because Amazon ships the orders for you. Gift Wrap Charges is the gift wrap income that Amazon takes back from you if you are using FBA to fulfill orders. These chargebacks happen because Amazon handles the gift wrapping. Sales Tax Collection is the fee that Amazon charges you for collecting sales tax. You can map individual transactions found on the order in this section. They are completely optional, but you can map them for better reporting. If you don't map any of these transactions, then we'll use the the account you specified in the Other Income Item and Other Fees & Expenses fields.